When the Sarjeant Gallery first opened in 1919, there were approximately 17 works recorded as being in the permanent collection. They were permanently displayed on the gallery walls. As the years passed, the collection grew with purchases from New Zealand and overseas, and generous gifts from artists and donors. Over time, it was no longer possible to retain everything on permanent display and a storage facility was needed. Creating a storage area in the gallery basement under the exhibition floors was the best option at the time and in 1966 a major part of the basement was expanded and excavated, a back entrance established and an 18,000 square foot concrete floor laid. Further extension to the space was made in 1968 until it encompassed the area under the dome and the west wing of the gallery. 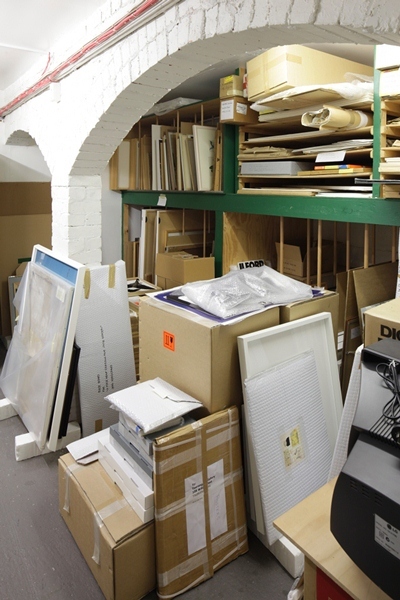 The collection has continued to grow and the storage space is seriously inadequate for the current collection of over 5500 artworks. There is no temperature and relative humidity control and the racks don’t make best use of the space available. In addition, the artworks are difficult to access. The redevelopment project to extend and earthquake strengthen the Sarjeant Gallery building is the perfect opportunity to address this issue. The collection is being moved to the temporary Sarjeant on the Quay site at 38 Taupo Quay. Sarjeant on the Quay is our first taste of improved storage with proper climate control and a mobile racking system that makes optimal use of available space. The racking was purchased with funding from the New Zealand Lottery Grants Board and is supplied by HydeStor. The store doesn’t however allow for future growth. 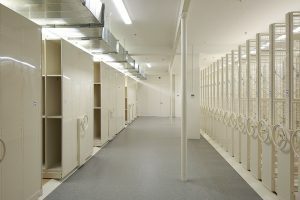 The racking system is modular and can be reconfigured for installation into the redeveloped Sarjeant when the collection returns to Queen’s Park. A major component of the collection move is the updating of information about every work into our database. This involves checking the accuracy of existing documentation and adding new information such as a photograph and location for every work. More extensive information will increase accessibility of the collection to the public. Such an initiative will project the breadth and depth of Whanganui’s treasures out into the wider world.